OPPO A83 vs ASUS ZenFone Max Plus: Which Value-For-Money Smartphone to buy? 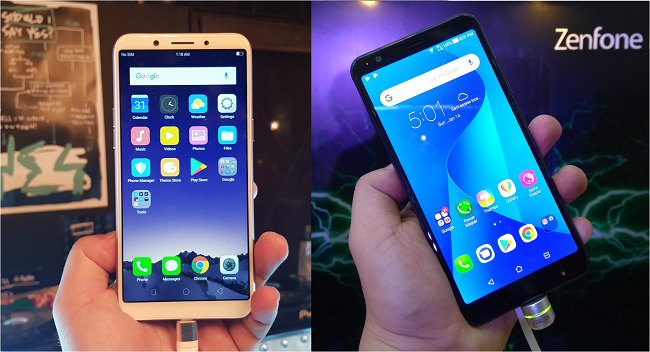 OPPO A83 takes on ASUS ZenFone Max Plus in our latest edition of specs comparison: The OPPO A83 vs ASUS Zen Fone Max Plus. OPPO A83 was just unveiled last night. It’s the 4th handset with 18:9 aspect ratio from the company; and it technically caters to the lower mid-tier range. This puts the OPPO A83 in an earshot postion from the current value-for-money king, the ASUS ZenFone Max Plus. This article will give you the pressing points on where these handsets win or lose over each other. Thus, let the comparison begin. Let’s start with the highly regarded feature, the display. The OPPO A83 and the ASUS ZenFone Max Plus both sport a 5.7-inch display with an 18:9 aspect ratio. However, The OPPO A83 only settles at HD+ resolution (720 x 1440p) while the ASUS ZenFone Max Plus packs denser pixels at FHD+ resolution (1080 x2160p). Both panels are treated with 2.5D glass, thus you’ll have better experience when you swipe thru the screen. The OPPO A83 houses the same chipset as its brethren, OPPO F5 and OPPO F5 Youth. It’s the MediaTek MT6763T aka Helio P23. It’s a proven and tested chipset that houses a powerful 2.5GHz octa-core CPU and a newer Mali-G71 graphics processor. On the other hand, the ASUS ZenFone Max Plus is powered by a slightly outdated processor, the MediaTek MT6750T which features 1.5GHz octa-core processor. When it comes to memory, the OPPO A83 is loaded with 3GB of RAM just like the OPPO F5 Youth. Meanwhile, the ASUS ZenFone Max Plus shades the former with its 4GB of RAM. Both come with 32GB internal memory. The OPPO A83 packs 13MP rear camera with f/2.2 aperture and LED flash. The ASUS ZenFone Max Plus boasts a dual-rear camera with 16MP f/2.0 + 8MP f/2.4 wide-angle lens. Thus, it's possible to capture Bokeh shots with the latter. In the selfie department, the OPPO A83 packs 8MP sensor with f/2.2 aperture and AI Beauty Technology; while the ASUS ZenFone Max Plus' selfie camera is an 8MP affair with f/2.0 aperture and screen flash. Based on sample selfie shots, I prefer OPPO's treatment on selfies which offers more natural feel to the outputs. The OPPO A83 packs 3180 mAh. From the looks of it, its HD+ display could help preserve longer mileage. The ASUS ZenFone Max Plus is dubbed as the “Battery King” with 4130 mAh. It may have bigger battery rating but the FHD+ resolution and the older chipset could possibly hasten its discharge rate. The OPPO A83 does not have fingerprint scanner but users can opt to use the facial recognition feature to easily unlock the phone. The ASUS ZenFone Max Plus, on the other hand, has both fingerprint sensor and facial unlock which also add another layer of protection to your phone. The OPPO A83 is only priced at Php 9,990 while the ASUS ZenFone Max Plus is priced at Php 11,995. Both handsets are now available in their respective concept stores nationwide. The OPPO A83 vs ASUS ZenFone Max Plus is a close fight. Both handset come with respective strengths in their specs sheets. OPPO A83 will no doubt have better selfies but the ASUS ZenFone Max Plus will outlive the former when we speak of battery life. The OPPO A83 has better and efficient processor while the ASUS ZenFone Max Plus has very promising point-and-shoot capabilities. If we talk about value-for-money, the OPPO A83 is more affordable than the latter; will this justify the lack of fingerprint sensor and the single rear camera? It's up to you to decide. Pinoy Metro Geek: OPPO A83 vs ASUS ZenFone Max Plus: Which Value-For-Money Smartphone to buy?